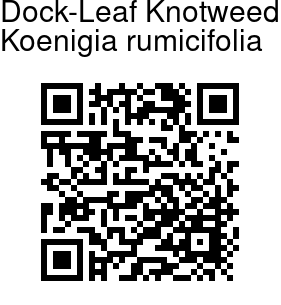 Dock-Leaf Knotweed is a robust, very leafy perennial herb with large dock-like leaves, and with usually dense clusters of tiny green flowers in leaf axils and at branch ends. Flowers are 4-6 mm across, with rounded spreading tepals. Leaves are green and rather fleshy, broadly ovate to ovate-heart-shaped, 8-13 cm long, blunt or somewhat pointed. Leaf-stalk is short, stout, up to 2.5 cm long. Stipules are large, lax, hairless. The plant has stout unbranched pale stem, 15-120 cm tall. Young shoots of the plant are edible. 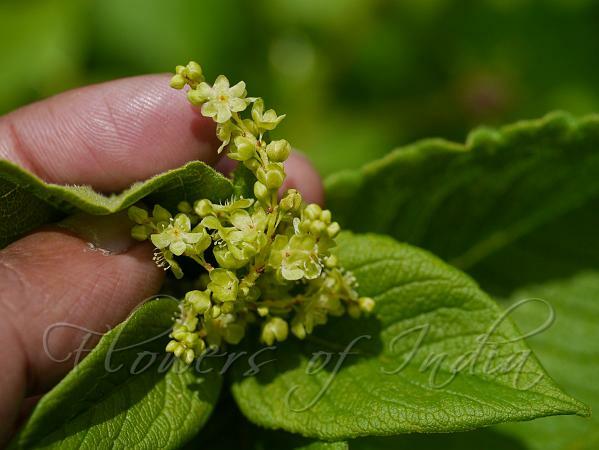 Dock-Leaf Knotweed is found in the Himalayas, from Afghanistan to C. Nepal and Tibet, at altitudes of 2700-4300 m Flowering: June-August. Photographed in Valley of Flowers, Uttarakhand.